One problem with recharging electric vehicles is finding a charging station on the road. Electric vehicle makers provide GPS clues on their moving map displays, and electric pilots will doubtless have markers for fields with appropriate facilities for our future E-flyers. Researchers at the University of Massachusetts at Lowell may have done an end run around that problem, though. 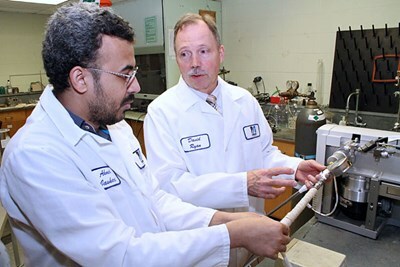 Their “new technology uses water, carbon dioxide and the metal cobalt to produce hydrogen gas on demand at a relatively low temperature and pressure.” The hydrogen produced goes directly to a fuel cell which generates electricity and powers the EV’s motor, rechargeable battery and headlights. When the canister that contains the H2 is empty, the driver can swap it with a “full” one. The researchers haven’t shared a great number of details, but we can guess the volume and weight of the canisters based on similar applications on the Pipistrel H4 and e-Genius, the much tested first and second-place winners, respectively, of the 2011 Green Flight Challenge. Asia Pacific Fuel Cell Technologies (APFCT), a Taiwanese scooter manufacturer, featured swappable H2 canisters for its scooters, and even demonstrated a 1,000 kilometer (620-mile) drive around the island on one weekend in 2010. As noted, the Green Flight Challenge winners started as a hydrogen-fueled craft in the case of e-Genius, and the Pipistrel G4 converted to H2 power following the contest and became the HY4. As annotated on the video, the 1,500-kilogram (3,300-pound) HY4 requires two large pressurized containers to hold two nine-kilogram (19.8-pound) helpings of hydrogen which give the craft its 800- to 1,500-kilometer (496-mile to 930-mile) range. 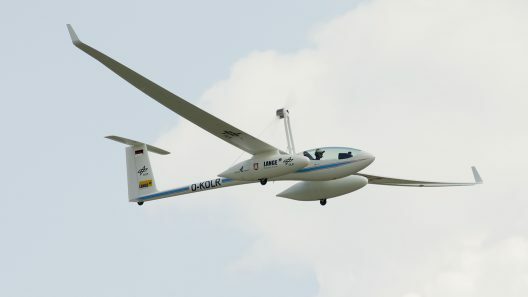 The Green Flight Challenge required a 200-mile trip around a 100-mile course with a demonstrated motor run of 45 minutes following the flight. This would be the planned range plus an FAA-mandated reserve for the batteries. Both winners managed that readily, but had little energy left past that test. Hydrogen power promises greater range for a small weight, but the containment and conversion of H2 to electricity adds some weight and complexity. 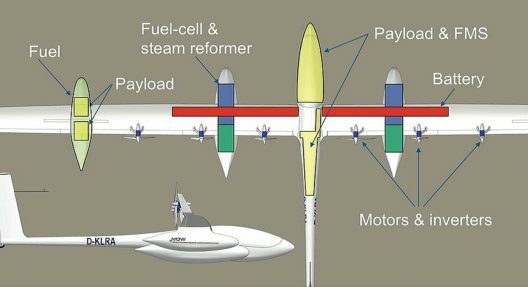 Hydrogenius, the originally-planned form of e-Genius, would have used 4.2 kilograms (9.24 pounds) of hydrogen to fly two passengers 750 kilometers at a cruising speed of 120 kilometers per hour (74.4 mph). Lange Aircraft has built two different hydrogen-powered craft, the DLR-H2 (which powers one electric motor via a fuel cell and hydrogen) and the E2, which will fly later this year. That uses 300 kilograms (660 pounds) of methanol to power its six fuel cell, six motor power system. Any greenhouse gas tendencies in the methanol are reduced to a water vapor exhaust. Most fuel-cell-powered vehicles have to stop for fuel from time-to-time. With only 30 hydrogen stations in the Los Angeles area and precious few sprinkled around the rest of the U. S., people won’t be taking their hydrogen vehicles for long road trips or flights. The infrastructure is not there yet to allow that. By putting the fuel in canisters that can be swapped, much like the Taiwanese scooters, the only infrastructure necessary is a willing shipping firm. Canisters contain water, carbon dioxide and cobalt metal particles with surface nanostructures billionths of meters in size to produce hydrogen gas on demand at a relatively low temperature and pressure. Working with Ryan are Ph.D. candidates in chemistry Ahmed Jawhari, Kehley Davies and Elizabeth Farrell; and Colleen Ahern, an undergraduate chemical engineering major and Honors College student. With efficiency, safety and ease of use prime factors in this innovation, we can only hope that its volumetric efficiency is such that is can fit in reasonably-sized vehicles. There seem to be enough other reasons for it to be successful.